Size: 20-30 ft. high, 20 ft. wide. Flowers: Small yellow flowers, spring; followed by black or purple berries; leaves are tough and fragrant. Uses: Background shrub, screen, or tree. Tolerates salt spray, wind, heat. Fire resistive. Wildlife: Attracts birds. Deer resistant. Pruning: Can be shaped as hedge or tree. Prune to control height and shape. Otherwise, no pruning needed. Pests & Diseases: Powdery mildew and black mold, anthracnose, insects such as sapsuckers; black scale, laurel psyllids. Notes: ‘Saratoga’ variety is more treelike and has broader leaves. Leaves used in cooking. 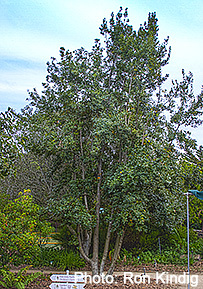 Another member of the Lauraceae family is the Camphor Tree (Cinnamomum camphora). Hardy to 0° F.